I was talking to Erika Landin the other day about MasterChef. Erika is the supervising casting producer and she was discussing how they haven't had any super-strong modernist cooks on the show in the previous seasons and very little molecular gastronomy. If you don't know much about MasterChef, one of its main differentiators is that it is strictly for home and "amateur" cooks. They also do open casting, meaning anyone can try out for the show (think American Idol). The top people then move on in the competition and start competing against, and with, each other. Erika was hoping I could help let the modernist cooking community know about the show and that they are looking for home cooks who are strong with modernist cooking. Standing out during the MasterChef open casting is a must, and it sounds like a knowledge of modernist cooking and molecular gastronomy is one way to successfully do that. "Do you have a passion for food? Are you a mad scientist in the kitchen? Do you want a chance to compete for a the title of MasterChef and a large cash prize? 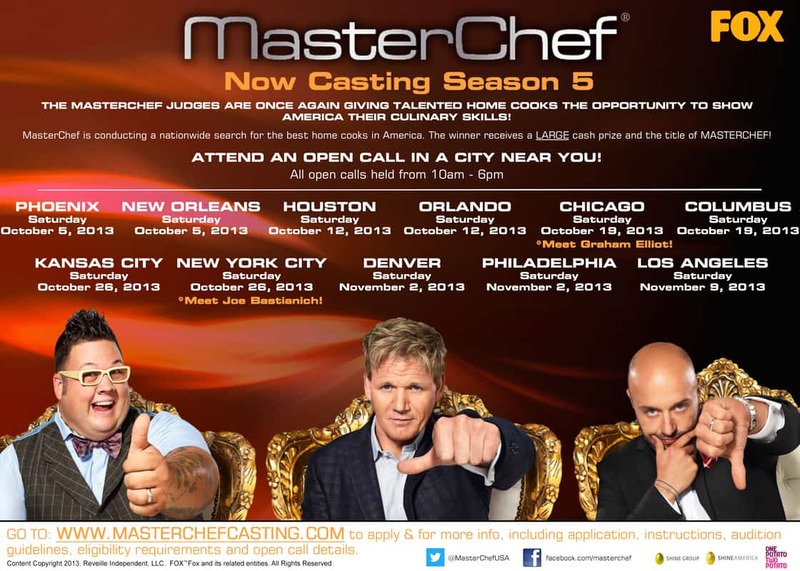 MasterChef is currently casting for season 5 and is seeking all types of AMATEUR home cooks. If this is YOU or someone you know then go to: www.masterchefcasting.com to pre-register and to get all the information about our open casting calls!" So if you want the chance to let Gordon Ramsey berate you, (and who doesn't!) then see if there are any MasterChef open casting locations in your area and give it a shot. You don't have anything to lose and it could be a great experience.